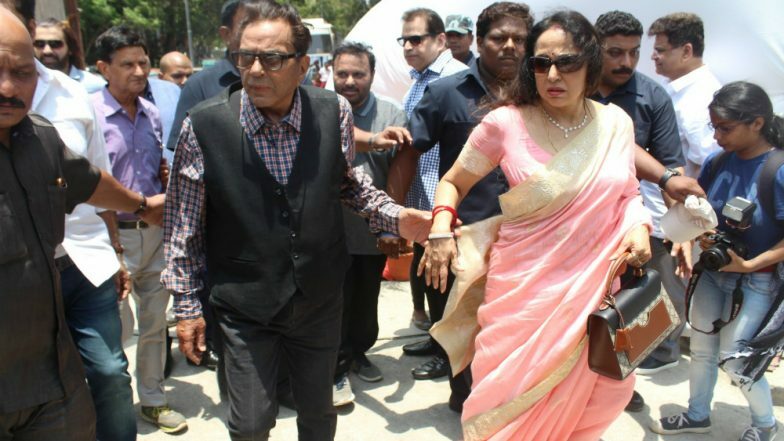 Mathura, April 14: Actress and BJP's Mathura MP Hema Malini was happy to have her husband, veteran actor Dharmendra, campaign on her behalf for a day in her constituency. "Today is also a special day for me! Dharamji is here in Mathura to campaign for a whole day on my behalf. The public is waiting eagerly to get a glimpse of him," Hema tweeted on Sunday along with a photograph in which the couple is all smiles. Hema Malini Has A Net Worth of Rs 101 Crore, BJP MP Files Lok Sabha Election 2019 Affidavit From Mathura.